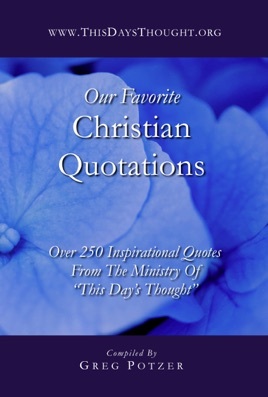 Over 250 thoughts to inspire you in your faith in Christ. Contains quotes from authors throughout the ages, such as John Shedd, C.S. Lewis, George MacDonald, Corrie ten Boom, D.L. Moody, C.H. Spurgeon, Saint Augustine, Robert Lewis Stevenson, G.K. Chesteron, Phillips Brooks, Charles Dickens, Blaise Pascal, Matthew Henry, Abraham Lincoln, Francis of Assisi, Mother Teresa, Billy Graham, Victor Hugo, Leo Tolstoy, Oswald Chambers, and hundreds more!